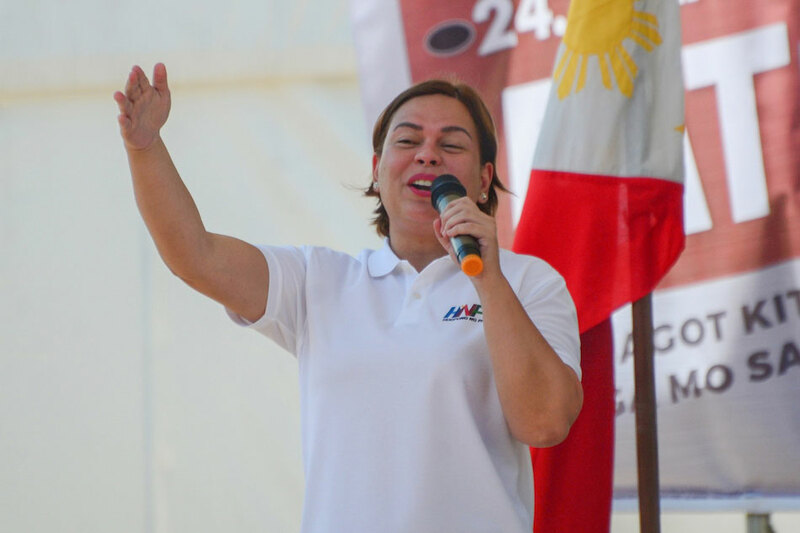 KORONADAL CITY – Davao City Mayor Sara Duterte-Carpio has chosen to be a “friend to all” as she endorsed competing candidates from Digos City and Sta. Cruz town in Davao del Sur. During the campaign sortie of regional party Hugpong ng Pagbabago (HNP) in Digos City on Tuesday, Duterte-Carpio proclaimed both Reynaldo Hermosisima and Nonito Llanos III, both running as independents, as HNP’s mayoral bets in the city. Duterte-Carpio also endorsed rivals Joel Ray Lopez and Alvin Rey Almendras, who are both eyeing the mayoralty in Sta. Cruz town. The Davao City mayor explained that by endorsing rival candidates, HNP is leaving voters the “free will” to choose their preferred bet. “Sinasabihan namin sila na kung puwede isa lang ang tumakbo, tatakbo na lang sa tingin natin ‘yung may mas mataas na chance na manalo but usually kasi, mayroon din naman free will ang mga tao and there’s democracy,” Duterte-Carpio told reporters on the sidelines of HNP’s campaign sortie in this city in South Cotabato. This was not the first time that Duterte-Carpio endorsed rival candidates. Last Feb. 19, she appeared with three rivals for the congressional race in Isabela. Duterte-Carpio acknowledged that not all HNP candidates will receive the support of dominant players in the local field. “Hinahayaan lang namin ang local partners. Hindi namin pinipilit ang mga candidates. Sinasabihan namin sila, ‘if you can help majority of the candidates. Duterte-Carpio is endorsing a 13-person senatorial slate for the race for 12 slots in the chamber. Her father, President Rodrigo Duterte, is meanwhile campaigning for five senatorial bets under the ruling party PDP-Laban. These five PDP-Laban candidates, namely former presidential assistant Christopher Lawrence “Bong” Go, former police and corrections chief Ronald “Bato” dela Rosa, reelectionist Sen. Aquilino “Koko” Pimentel III, former presidential political adviser Francis Tolentino, and Maguindanao Rep. Zajid “Dong” Mangudadatu, also belong to Sara’s HNP slate. However, in some local races, PDP-Laban is clashing with bets who are running under HNP-affiliated local parties. Such dynamics limit the presence of Pimentel, the PDP-Laban president, in HNP rallies. University of the Philippines political science professor Aries Arugay said the separate slates of the President and his daughter indicate that the Dutertes, relative newcomers in the national political scene, are hedging their bets in order to muster as much support from local politicians. “The differences in the slates has something to do with the Duterte family being invested in local races. It tells you they would rather hedge their bets locally, in order to make sure that they have the loyalty of whoever is going to be elected,” Arugay told ABS-CBN News. Squiggly makeup: What’s behind this latest viral beauty trend?